A to Z Eye Care is dedicated to providing the best vision care to each patient that enters our office. Comprehensive eye examinations are a vital part of maintaining eye health and overall health by providing early disease detection. Our doctors and their exceptional team are happy to provide these eye exams to determine the best vision care for each patient. When Should Eye Examinations Begin? 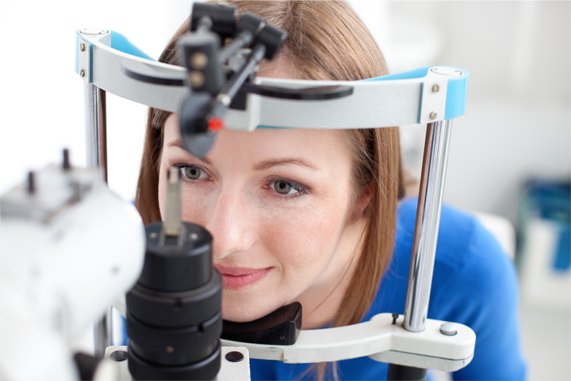 Our recommendation is that a yearly eye exam should begin at six months of age. It is important to understand that vision screenings performed by a school nurse or your employer are not the same as Comprehensive Eye Exams. There are two parts to the exam performed in this thorough eye exam, including many other eye care procedures. In the first part of the exam, we use the latest in computer and laser technology to give an accurate examination that will determine your exact prescription for the most comfortable, clearest possible vision. During the second part of your examination, our optometrists and staff perform a complete health check that includes eye pressure, screening visual fields, a dilated exam of the back of the eye and a microscopic evaluation of the front of the eye. During this part of the exam we test for diseases such as glaucoma that have no early symptoms but could lead to vision loss if not detected early. We also offer retinal digital imaging frequently referred to OPTOS to serve as a base line and to better document the health of your eye. As soon as you walk through the doors of our Arcata office you will be greeted by our receptionist who will determine the best way we can serve your eye care needs. The next step will be to meet one of our highly trained Assistants and Contact Lens Technicians, who will begin your exam. They will begin evaluating your eyes before you see one of our doctors. For contact lens wearers, the Doctor will do a third part of the exam that will include checking the health of your eye for contacts and a contact lens prescription. The doctor will be joined by one of our opticians who are the experts in eyewear selection, measurement, adjustment and repair. Together the doctor and the optician will review the results of your exam, explain your insurance, answer any questions you have about your eyewear, and help you order glasses. At the end of your exam, our benefit coordinators, will help you to utilize your vision care and medical health insurance plans for the maximum benefit. Come Visit Your Local Eureka Optometrists! From the moment you receive your first comprehensive eye exam, you will be embarking on a journey to clearer vision with a team of doctors dedicated to providing you with the highest quality of eye care, the most stylish eyewear and a truly personalized experience. If you’re interested in learning how we can customize your treatment, contact us today and we’ll be more than happy to answer your questions and schedule an appointment for you!